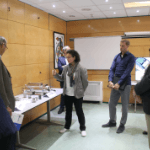 In this section you can find technical information to download or consult. Circulation of pumped fluids from the discharge to the seal flush connection, passing through a flow rate controller and a heat exchanger. 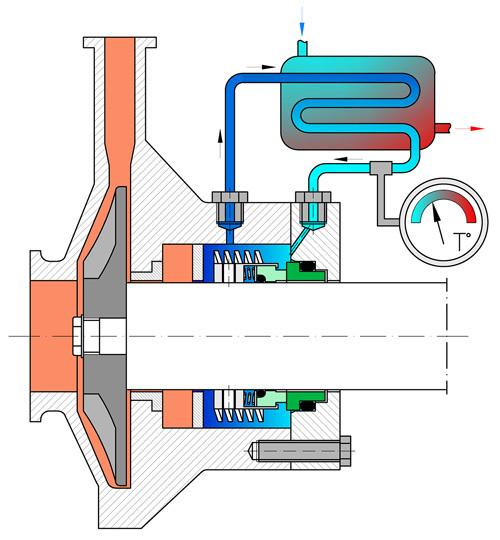 To control the fluid temperature in the seal chamber. This prevents the vaporisation of the fluid between the seal faces. Clean fluids at high temperatures. Hot water, boiler food products. Hot oils. 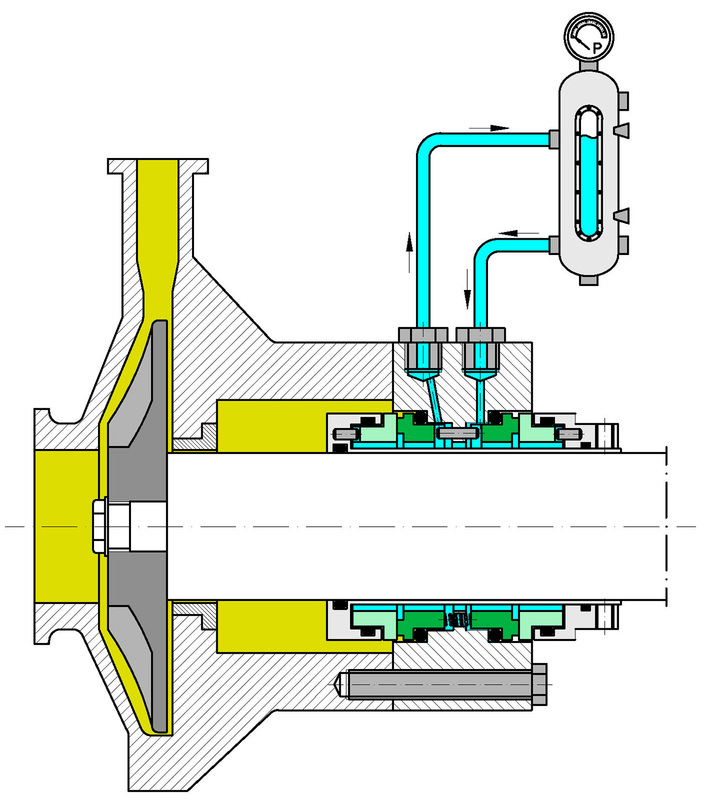 Circulation of the pumped fluid from the pump discharge to the seal chamber, passing through a cyclone. Fluids with solids are returned to the suction area. 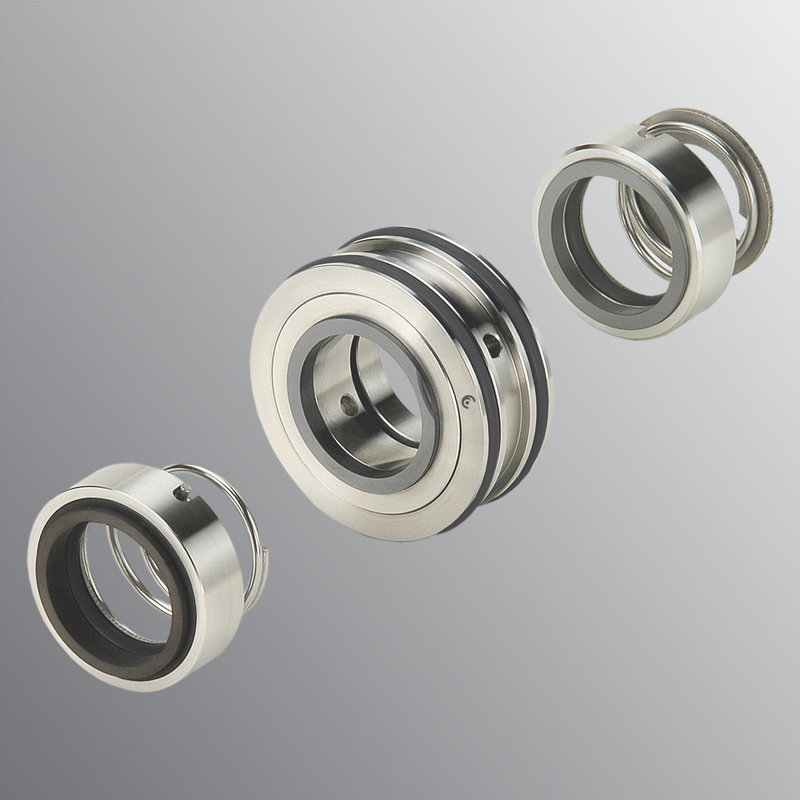 To prevent the abrasion of the mechanical seal by particles. Fluids with suspended solids whose specific gravity is twice that of the fluid. In vertical pumps, a shaft bushing must be included at the base of the compartment. Static column of non pressurised fluid inside a tank, through the quench connection. To prevent potential leaks from being emitted into the atmosphere. Fluids that crystallise when in contact with the atmosphere. Dangerous fluids with low concentrations. Forced circulation of an external non-pressurised fluid used as a barrier fluid. This fluid is circulated through a pumping ring due to the thermo-siphon effect. 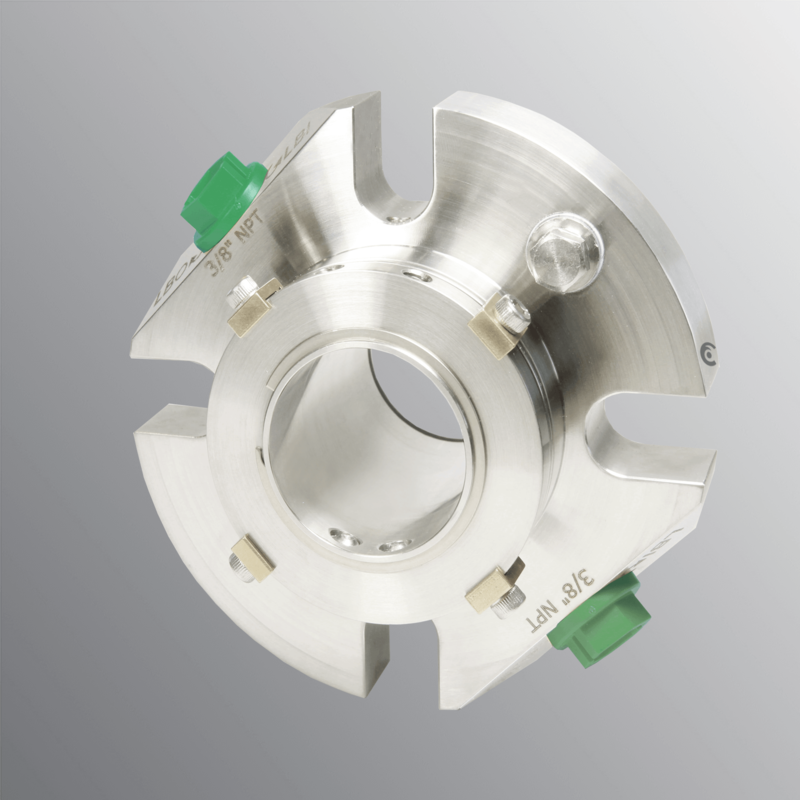 To prevent atmospheric contamination in the event of leaks, using the external seal (atmospheric side) as a safety seal. Zero or very low emissions. 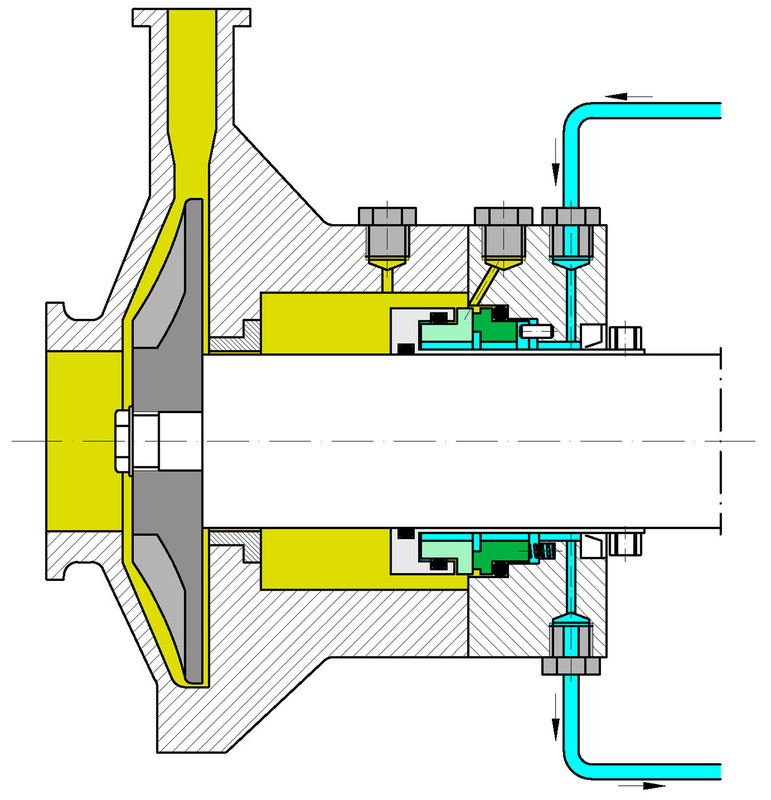 Non-pressurised, double seal layout (tandem). Fluids that crystallise or vaporise when in contact with the atmosphere. Dangerous fluids with low concentrations, explosive or flammable fluids. 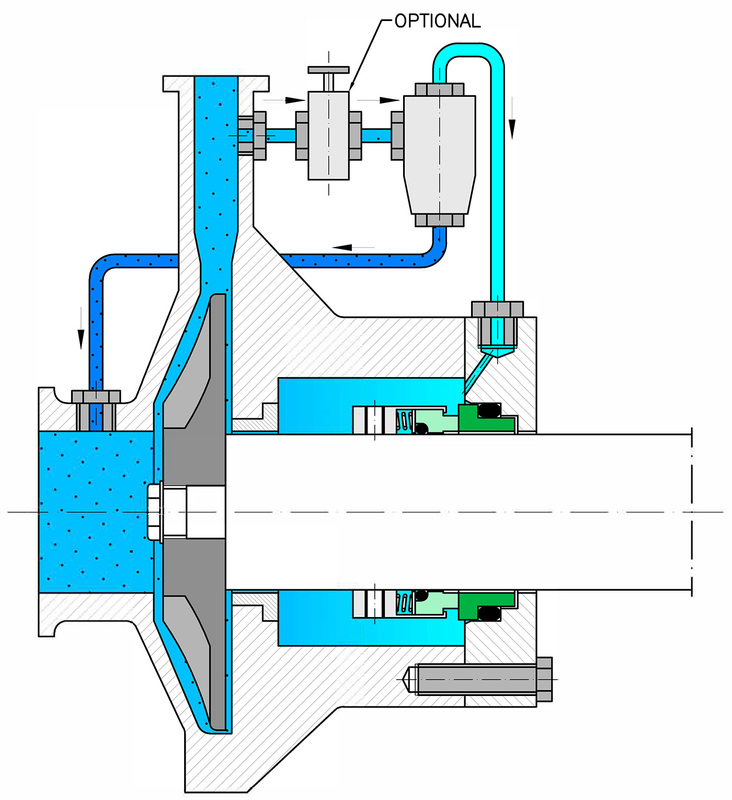 Forced circulation through a pumping ring of a barrier fluid in a pressurised tank with a pressure that is 2 bar higher than the product fluid. Fluids that crystallise or vaporise when in contact with the atmosphere. Dangerous fluids with high concentrations, explosive or flammable fluids. 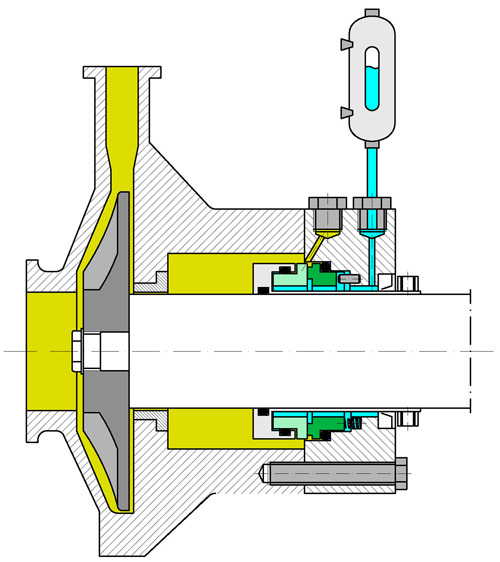 Injection of an external fluid to be used for quenching and flushing/washing. 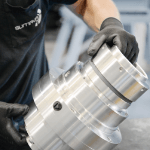 The quench lubricates the seal contact surfaces on the air side, with vapour or water. The flushing/washing operation has a lubricating function. 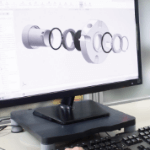 To guarantee seal lubrication, reducing the formation of particles between the contact surfaces due to carbonisation, oxidation or crystallisation. 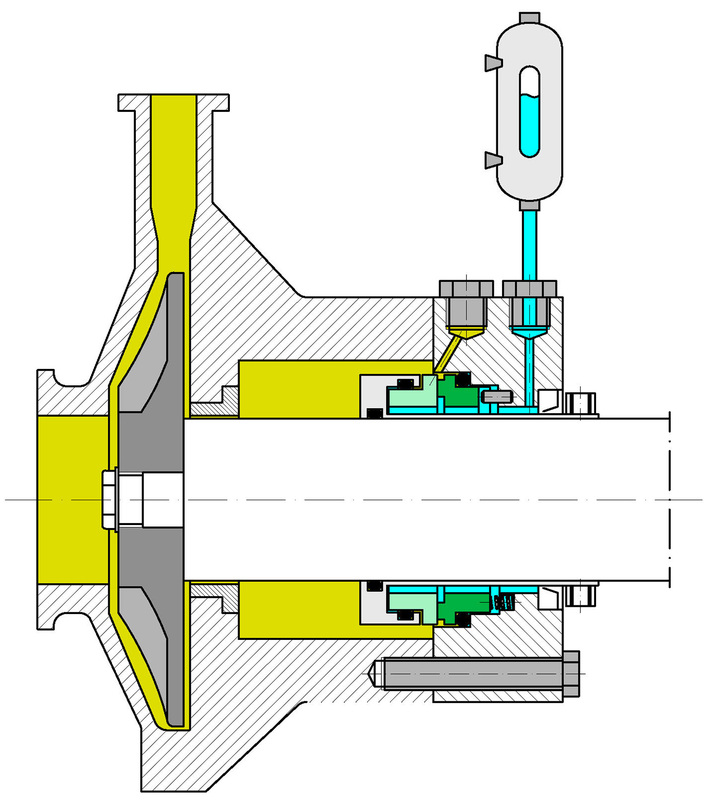 Single seal layout. Fluids that crystallise when in contact with the atmosphere or generate solid deposit that block or stick to the seal faces.